Cross-border trade with Mexico surged following NAFTA. It’s fair to presume NAFTA is not the sole cause of the increase in trade, but it is also fair to presume that NAFTA helped. Increased trade is a benefit to both parties, otherwise, the trade would not take place. Trump now threatens to kill the trade golden goose and US farmers are in the crosshairs of the dispute. Any unraveling of NAFTA could hit deeply enmeshed cross-border food supply chains. Please consider US Farmers Rattled by Trump’s Mexico Plans. Corn is the biggest of the US’s $17.7bn in agricultural exports to Mexico, a value that has risen fivefold since the countries signed the North American Free Trade Agreement. Mexico’s exports to the US have grown even faster to $21bn, led by fruits and vegetables such as lemons and avocados. Farmers, traders and food executives on both sides of the border are therefore paying close attention to Donald Trump. The US president has pledged to revise Nafta, wall off the border and possibly slap Mexican imports with tariffs. Trade in agriculture could end up a casualty. Trump has already withdrawn from the 12-nation Trans-Pacific Partnership, a trade deal with strong farm-belt support. He has called Nafta, which also includes Canada, “unfair” and a “catastrophe”. The president’s comments suggest he is more concerned about manufacturing jobs than where food is produced. 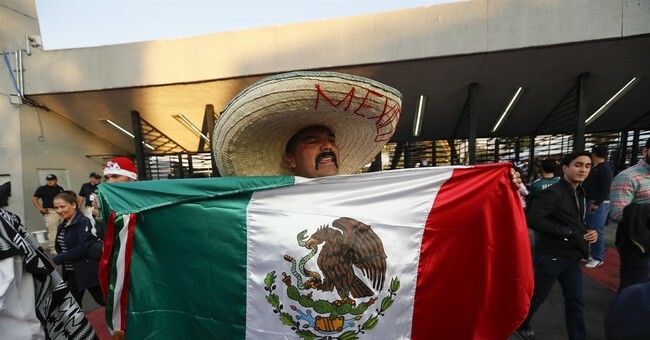 But US farm groups fear being targeted by Mexico in retaliation. Richard Feltes of commodities broker RJ O’Brien in Chicago, says: “The soft spot for Trump would be hitting back at America’s heartland.” Most states in the US corn belt voted for the president. Unravelling Nafta could be complicated because US and Mexican food supplies have become deeply enmeshed. In the beef market, calves raised on pastures in Mexican states such as Chihuahua are sent across the border at about a year old. Texas feedlots fatten them, then US packing plants slaughter them. Cuts of beef such as chucks and rounds are shipped back to Mexican cities. 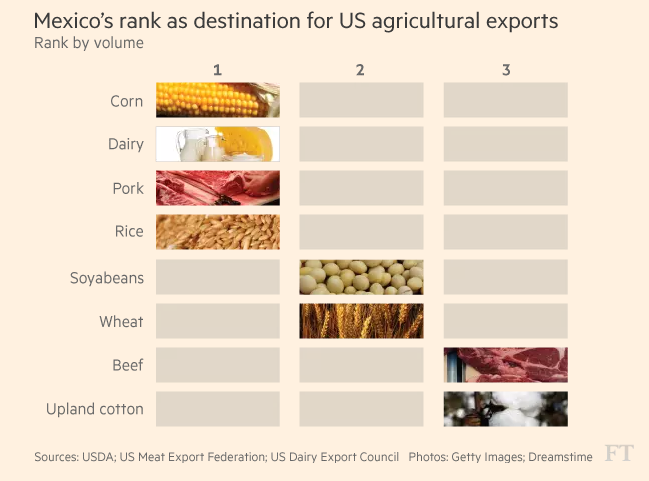 The top 10 companies exporting foodstuffs from the US to Mexico include trading houses such as Bartlett Grain, ADM, Cargill and CHS, as well as meat companies such as Tyson Foods and JBS, according to Panjiva, a trade data company. The top 10 companies shipping north include Driscoll’s, a berry grower; Grupo Viz, a Mexican meat supplier; Mondelez, the US snacks company; and Mission Produce, an avocado producer. Likely Effects of a Trade War for U.S. Agriculture? Sad! Research Institute and a former Chief Economist for the USDA says Likely Effects of a Trade War for U.S. Agriculture? Sad! How important is trade to US agriculture? US agricultural exports averaged over $142 billion over 2013-15. Over the same period, the US enjoyed a $25 billion net agricultural trade balance. Based on the value of agricultural production, roughly one-third of what is produced by US farmers and ranchers is exported and for many commodities such as soybeans, wheat, and cotton, more than 50 percent of the crop is typically exported. Moreover, with a slowing population growth rate at home, more than 97 percent of the anticipated population growth over the next 35 years is anticipated to take place outside of US borders. Those facts explain why US agricultural interests have been such strong supporters of free trade agreements in the past. US agricultural exports to China, Canada and Mexico averaged $63 billion over 2013-15, accounting for 44 percent of total agricultural exports. In addition, sales by US-owned food processing companies in Canada, Mexico, and China totaled more than $58 billion in 2014 and accounted for about 25 percent of sales of US-owned food processing companies worldwide. Actions by President Trump to make good on campaign promises to raise tariffs on China exports to 45 percent would surely be met with countermeasures that could potentially devastate US agricultural exports. While some have argued that China would be unlikely to cut off food imports necessary to meet their growing consumer demand, those arguments ignore the fact that there are many other suppliers in the world – particularly in South America and the Black Sea Region – which have the capacity to ramp up production and exports to meet those demands. US farmers and ranchers would likely be the primary losers, particularly as China demand increases over the long run. The President-elect has also blamed NAFTA, particularly Mexico, for many of the economic woes facing the United States, and has threatened to renegotiate an agreement that has been in force since 1994 (and in the case of the Canadian-US free trade agreement since 1989). With a few key exceptions, trade in agricultural products under NAFTA is now free of tariff and quota restrictions. Bilateral agricultural trade between the US and Canada has grown at an annual rate of 7.3 percent since 1990 and averaged $43.7 billion over 2013-15. Bilateral trade between the US and Mexico has grown at an 8.3 percent annual rate since 1990 and averaged $37.7 billion over 2013-15. Since the election, a number of farm leaders and Congressional members have sought to moderate the President-elect’s views on trade. Whether their views will alter his actions is thus far uncertain. In his book Peddling Protectionism: Smoot-Hawley and the Great Depression, Douglas Irwin recounts how economists at the time were almost unanimous in their opposition to passage of the Smoot-Hawley Tariff Act that raised tariffs on more than 20,000 imported goods. To that end, a petition signed by 1,028 American economists was presented to then President Herbert Hoover to veto the legislation. For US farmers (as well as US consumers) let’s hope the current President-elect heeds the warning more than did his predecessor. President Trump and his trade czar, Peter Navarro, are moaning and groaning about NAFTA and the US trade imbalance with Mexico. “NAFTA has been a catastrophe for our country; it’s been a catastrophe for our workers and our jobs and our companies,” said Trump on February 2. Let’s investigate this allegedly catastrophic deal for the US with a set of pictures. If anything, NAFTA stabilized or increased US manufacturing jobs for six or seven years due to an increase in bilateral trade. The demise of US manufacturing jobs started in June of 1979, long before anyone could blame either Mexico or China. It’s impossible to make a realistic case that NAFTA hurt the US. The seeds of trade imbalances were sewn in 1971 when Nixon closed the gold window. The trade deficit rose, then skyrocketed. Smoot-Hawley did not cause the Great Depression, but it certainly made matters much worse. In general, that’s precisely what tariffs do in every case. No one wins trade wars. Both sides always lose something. In the case of unwinding NAFTA, Mexico would get hit harder, but US farmers would also pay a price. Net it all out, and US farm losses will be much greater than manufacturing gains (if indeed any). Here’s an additional chart that shows how silly it is to blame NAFTA for the demise of manufacturing jobs. The manufacturing percentage of nonfarm employment is under 8.5%, down from nearly 39% during WW II. If farm employment was factored in, the current percentage would be even lower. Discounting war effects, there was a steady decline in the percentage of people employed in manufacturing from 1952 until 2009. That persistent decline has finally tapered off. Trump is fighting a problem that no longer even exists! Perhaps he backs down again.